Background: An increased incidence of cholelithiasis is reported after truncal vagotomy and gastric resection. Adhesions from previous gastric surgery are often considered a contraindication to laparoscopic surgery. Aim was to evaluate the feasibility and long-term results after LC and CBDE in patients with a previous gastric resection. Methods: from April 1991 to February 2007, CBD stones were present in 363 out of 3455 patients (10.5%) (139 males, 224 females, mean age 57.6 years, range 12-96 years) who underwent LC. Among these, 19 patients (13 males, 6 females, mean age 66.3 years, range 30-79 years) had a previous gastric resection (18) or gastrectomy (1). Retained CBD stones were safely treated through the biliary drainage sinus tract. At a mean follow up time of 130.8+/-26.4 months (range 70.6-178.7 months) no biliary stricture at the site of the choledochotomy has been observed. 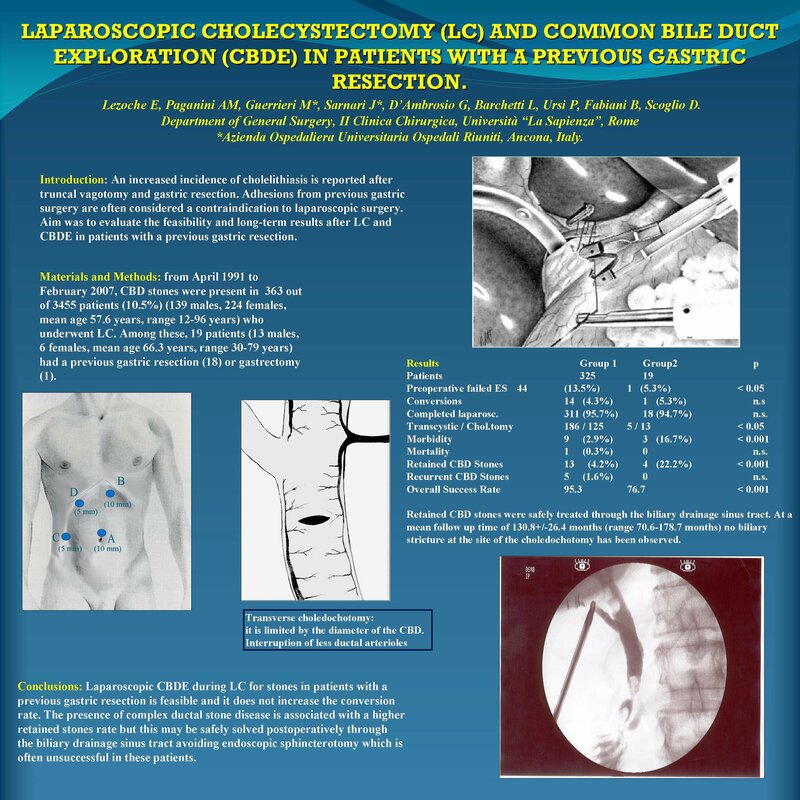 Conclusions: Laparoscopic CBDE during LC for stones in patients with a previous gastric resection is feasible and it does not increase the conversion rate. The presence of complex ductal stone disease is associated with a higher retained stones rate but this may be safely solved postoperatively through the biliary drainage sinus tract avoiding endoscopic sphincterotomy which is often unsuccessful in these patients.